Searching for a document in a-z.lu is simple. Type one or more keywords in the search bar and then click the search button. a-z.lu automatically searches in all contents. 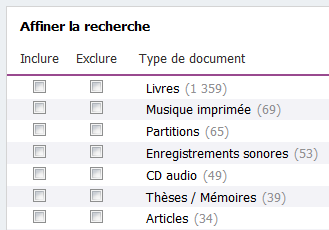 In order to narrow down your search you can select a tab limiting your search to the digital library, eluxemburgensia.lu and/or a specific library by choosing it in the dropdown menu under My bibnet.lu. If you wish to search for a keyword in a specific field, you can use the dropdown menus beneath the search bar. These menus enable you to limit your keyword search to authors, titles, subjects, or, when available, the actual text of the document. a-z.lu incidentally enables you to carry out a detailed search without needing to use the Boolean search operators AND, OR, NOT (they can, however, still be used for a more detailed search). a 'snippet' – this appears if the keyword was found in the text of the document, the index or one of the cover pages. under the heading 'Details' in the column 'Links' you can occasionally find a red house icon , which provides a link to the Dictionary of Luxembourgish Authors, providing more information on the author. Click on the link 'More filter options' to include or exclude one or more categories. All the selected filters can be removed by clicking the 'x' on the selected filter at the top of the results screen. a-z.lu offers you the possibility to sort the results according to your preferences: by relevance, publishing date (from most recent to oldest), by popularity, by author or by title. By default, results are sorted by relevance – calculated by the system on the basis of several parameters – to indicate the results which are most closely related to your search. To calculate the relevance of your results, the system analyses the keywords and their relevance in metadata as well as the integral text (a match in a title will be considered more relevant than one in the integral text). The sorting based on popularity displays the results depending on how often the title has been consulted by a-z.lu users (a click on the link 'Get this at a library' or 'Check online access' has more relevance than a click on the link 'Details' in the bibliography). Why can’t I order a book? It’s possible that the library you would like to order the book from does not offer online access to their ordering system. Click on the information icon next to the name of the library to find their contact details. If the library offers online orders, check whether you have the rights to reserve a document in that library and whether your inscription is up to date. To check which libraries you are registered with, click on the heading 'My account'. If the notice is in red it means that the inscription is in need of renewal.